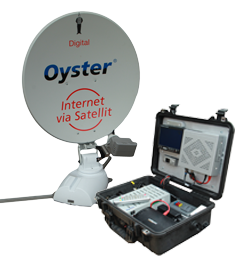 Latest News > Case mounted Satellite Broadband now available! Now available exclusively from Conrad Anderson is the NEW Case mounted portable Satellite Broadband system. Using the revolutionary Oyster Internet unit, this system will enable your business to receive high speed broadband internet whenever and wherever you are. High speed 10Mbps down / 256Kbps up throughout Western Europe. Risk of damage to system reduced by bespoke case. Waterproof Pelicase, housing the electrical control systems etc. 20 metres of cable gives flexibility on mounting sites.